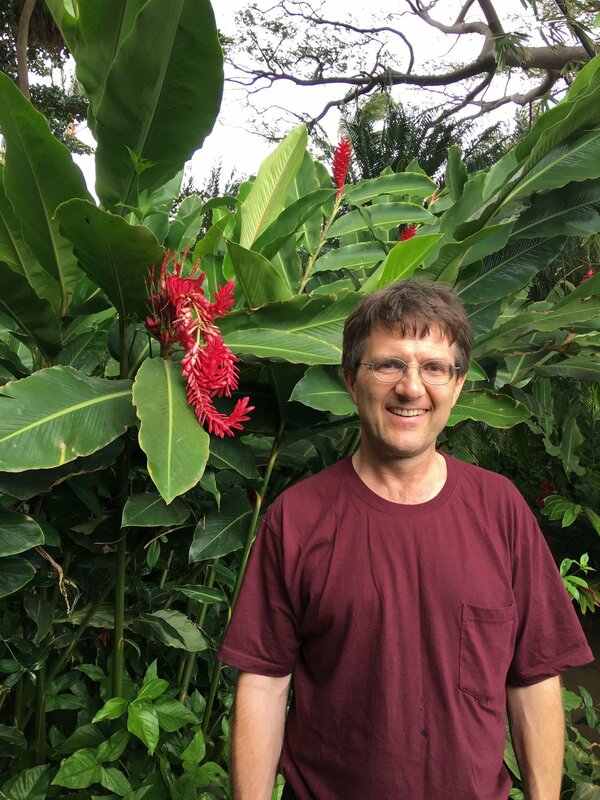 Miles Kimball in Maui, November 2017—1/3 of a century wedding anniversary trip. Photo by Gail Kimball. See Gail's guest posts here and here. I have been thinking about macroeconomics for 42 years. As for many other areas, I have many strongly held views. Fortunately, by the customary standards of the economics profession, I have paid my dues enough that most economists would consider me to have earned the right to strongly held views, even if they disagree with them. In particular, I know personally the authors of many of the most popular macroeconomics textbooks, and am confident that they would be OK with me talking back to them on the question of how macroeconomics should best be taught. My dissertation advisor Greg Mankiw is the author of two bestselling macroeconomics textbooks: one at the Principles of Macro level and another at the Intermediate Macro level. Greg in particular would be OK with instructors having a back and forth dialectic between the views he presents and the views of the instructor of a macroeconomics course. Macroeconomics is a young field. Not everything in macroeconomics has been figured out. There are many things on which almost all macroeconomists agree. But there are many other things in macroeconomics on which there is no fully-agreed-upon consensus. So understanding macroeconomics requires learning to deal with debate. Dialectic, "the art of investigating or discussing the truth of opinions" (definition from Google), is an appropriate word here. Dealing with debate means not every issue will be nicely wrapped up in a bow. Students need to develop the skill to understand arguments, evaluate arguments, and formulate their own arguments. There are two big purposes for taking a course in macroeconomics: gaining key skills, and gaining familiarity with key ideas related to macroeconomics. Let me start by laying out the key skills I want my students to gain, then touch on some of the ideas I want my students to become familiar with. I consider the skills that students learn central because it is always possible to learn facts later on. But a college class is a golden opportunity to learn tough skills. Bryan Caplan has a book claiming that students don't really learn much in college. I hope that isn't true. And if it is true in general, I hope it isn't true in my class. Reading: the ability to read articles in the newspaper and posts in the blogosphere and understand them. Writing: the ability to think of an angle with some bite to it, come up with a thesis statement and defend it. Math: the ability to answer the question "how much" using the tool professional economists use routinely to answer this question: logarithms and the concept of a percent change as the change in a logarithm. Graphing and Logic: the ability to work through the implications of a shock on many variables in a complex set of graphs and to figure out the directions of some effects that might look ambiguous but aren't. Asking my students to write a blog post of their own each week, talking back to articles in the newspaper, articles online and even things I say, is the main way I organize things so students learn better how to write. I have had a lot of success in getting students to write quite well, as you can see from all the posts my students have written that I made into guest posts on this blog. I wrote "On Having a Thesis" and "Brio in Blog Posts" to help students with the basics of writing. I believe enough in the importance of writing that I spend significant class time early on talking about it. And the main job of my teaching assistant is to read and give feedback on students' writing. I hope that needing to get ideas to write about—and especially identifying other people's opinions they disagree with, helps students to learn to read better as well. In addition, I assign many of my own blog posts as extra reading assignments so that students are confronted with learning how to read and understand that kind of writing as well as to read and understand the kind of writing in the textbook. Update: See "Critical Reading: Apprentice Level." My starting point for teaching how to use logarithms and "Platonic" percent changes defined as the change in logarithms is to have them read "The Logarithmic Harmony of Percent Changes and Growth Rates." I push those techniques further in "The Shape of Production: Charles Cobb's and Paul Douglas's Boon to Economics" and in many exercises on my Intermediate Macro website. In particular, see the resources linked here. To teach graphing and logic, I emphasize a set of international finance graphs you can see below. I augment the large open economy graphs from Greg Mankiw's textbooks with an extra graph on the right showing physical investment as a function of the real interest rate. I also have two different versions: long-run and short-run. The long-run graphs have the market for loanable funds on the left, while the short-run graphs have the central-bank-determined real interest rate on the left. The other three graphs in the set of four stay the same between the long-run and short-run. If you want to see where logic comes in for resolving seeming ambiguities, take a look at this post from the class website. But it is quite advanced. Don't try until you are far along in my class or otherwise have a lot of training in economics. You can see my views about the primacy of skills in "The Coming Transformation of Education: Degrees Won’t Matter Anymore, Skills Will." I don't want my students to just get a degree. I want them to be able to impress employers with their skills, and to have the skills they need when they themselves becomes bosses. I don't get bent out of shape trying to expose my students to every significant idea in macroeconomics. That would be impossible in one semester, even given what they have already learned in Principles of Macro. My main hope for students to learn every significant idea in macroeconomics is for them to get interested enough in reading the news and reading in the economics blogosphere. Decades of reading beats whatever can be taught in one semester, hands down. The difference between the short run and long run. The art of economic modeling and how the concept of "exogenous" and "endogenous" set the boundary of any particular economic model; what is "exogenous"—outside the scope of things to be explained—in one econonomic model may be "endogenous"—within the scope of things to be explained—in another model. One objective of economic research is to bring more and more things within the scope of things to be explained by economic models. But in learning, it helps to start with simpler models and gradually work one's way up to models that bring more things within the scope of things to be explained. Why central banks are able to have a big, important effect on the economy in the short run, but in the long run can only affect inflation and other relatively important things like real money balances. Why net exports ("the trade balance") is determined by what people want to do with their savings. How the four main contributors to growth in per capita income are (a) physical capital accumulation, (b) education or "human capital accumulation," (c) copying technology from other countries, and (d) inventing new technology. Why it takes a long time to see the benefits of physical or human capital accumulation. Where we are in relation to the potential of capital accumulation to raise long-run consumption. Why low capital requirements are like having thin, easy-to-topple dominoes and high capital requirements are like having fat, hard-to-topple dominoes. In the long run, central banks control inflation and therefore the nominal interest rate, but cannot control the real interest rate. This means for example that pension funds that want a higher long-run interest rate are mistaken when they complain that central banks have made the long-run interest rate too low. Some countries share their monetary policy with other countries. The euro zone is the most important example. Credit policy may be useful for macroeconomic stabilization when the shared monetary policy is not well-adapted to the regional situation. Denmark, which is not in the euro zone, but keeps a fixed exchange rate with the euro, has used credit policy to good effect. See my Wakelet story "Denmark's Brilliant Stabilization Policy." Anyone who wants to be a B student, an A student or learn even more than that should read the book Make It Stick. I can summarize the main point this way. If you want to get knowledge into long-term memory, reading and rereading won't do the trick. Your brain only puts something into long-term memory if you prove to your brain that it is worth remembering that thing by trying to remember it. So the activity of trying to remember things is the key to learning something not just for the exam tomorrow but learning it for good. Besides telling my students what I just said in the last paragraph, the way I use this principle in my class is by treating exams primarily as learning opportunities and only secondarily as evaluation devices. Exams cause students to try to remember things. Before each of the three exams, I ask students to do over the weekend the exam from the previous year as a practice exam—under time pressure. Then I go over that practice exam carefully in the class right before the exam. After the exam, I consider the class where I go over the answers one of the most important class periods for learning. When I write each exam, I am thinking about what I most want students to remember down the road, since I know they will remember what ended up on the exams much more than any other specific things from the class. The answers to the exam questions represent the bulk of the key ideas and some of the key skills I want the students to take away from the class. Update: I channeled the book Make It Stick in this Quartz column: “The Most Effective Memory Methods are Difficult—and That's Why They Work.” Be sure to take a look at that column. "Macro" comes from the Greek word for "large." To me, macroeconomics is exciting because the issues it addressed are a big deal in the real world. Debates about macroeconomic policy are the heart and soul of macroeconomics. And anything that is a really big deal for overall economic welfare is appropriately a part of macroeconomics. It doesn't make sense to study macroeconomics without talking about the ways in which we might be able to make the world a better place by judicious economic policies that have a big effect on the economy as a whole. Finally, macroeconomics tends to focus on overall economic growth. But fairness is also important. In the buzzwords from Principles of Microeconomics, "equity" matters as well as "efficiency." The two topics I don't have time to cover in Intermediate Macro, but did cover when I taught Principles of Macro, were how to calculate present values to figure out how much saving you need to do for retirement, and how to apply diminishing marginal utility to think about social welfare functions. You can see a hint of how I taught those ideas on my Principles of Macro website. You can see more of how I approach social welfare functions in "What is a Supply-Side Liberal?" and "Inequality Aversion Utility Functions: Would $1000 Mean More to a Poorer Family than $4000 to One Twice as Rich?" To see why you should be concerned about issues of fairness, see Brad DeLong's eloquent technical discussion of the objective function of the free market here. Other Posts that Are on the Advanced Side, But Could Be Useful in Teaching Macroeconomics"